The Feast of the Black Nazarene is held every ninth of January in Manila’s Quiapo district. 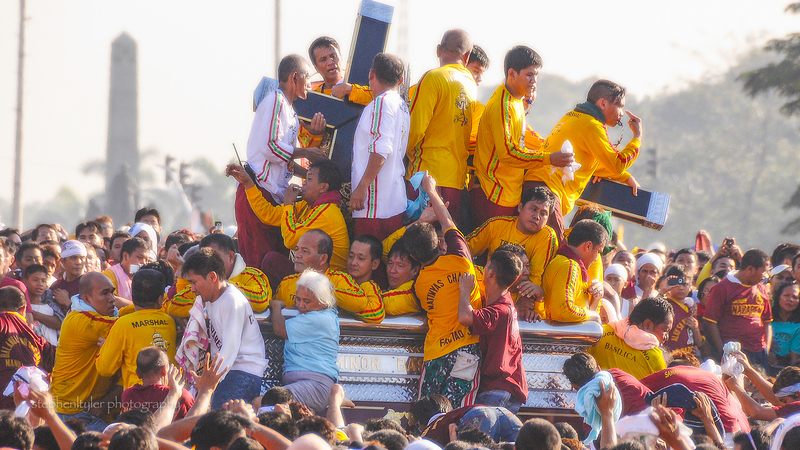 Millions of devotees flock just to get a glance – or even touch – the life size statue of the Black Nazarene, which depicts a black Jesus Christ carrying the cross, as it moves on a carriage pulled by long ropes slowly amongst the packed streets on a path from Rizal Park towards the Minor Basilica of the Black Nazarene that is known as Quiapo church. The statue is renowned in the Philippines and considered miraculous by many Filipino Catholics. For this reason, many throw personal items of cloth to be rubbed against the statue; some, like this old woman, cling for dear life in what appears as a moment of madness with hopes to receive blessings from God. it’s a maddening scene – amazingly, very few people die..